Luminate Wellness believes that there are many wellness tools to support our health and wellness. A wellness tool is anything that supports our health and wellness from listening to good music, going for a walk, spending time in nature, or using essential oils. The jewelry is a very simple way to make sure we have this tool with us every day. We sell more than just pretty jewelry. These pieces are powerful supports for our emotional wellness. CANADA–Your bracelet will be mailed within 7-14 days of purchase. Shipping times vary. US–Your bracelet will be mailed within 10-16 days of purchase. Shipping times vary. Some examples of bracelet styles. These bracelets are more than just pretty jewelry. They are intention setting tools–a reminder to take some time out of our day and deeply breathe in these powerful aromatic compounds that can support us in shifting our moods and energy. We can custom make a bracelet with stones and colours that light you up! Please note: I will be on vacation from August 11th–August 26th, 2017. Any orders placed during that time will be shipped in September. If you have a promo code for a discount, input it at check out. Upon checkout please request basic colours and or stones you are wanting. We will do the best we can to meet your wishes, depending on our current stock at the time of ordering. Please also tell us the size you need. These bracelets look fantastic in stacks of three! 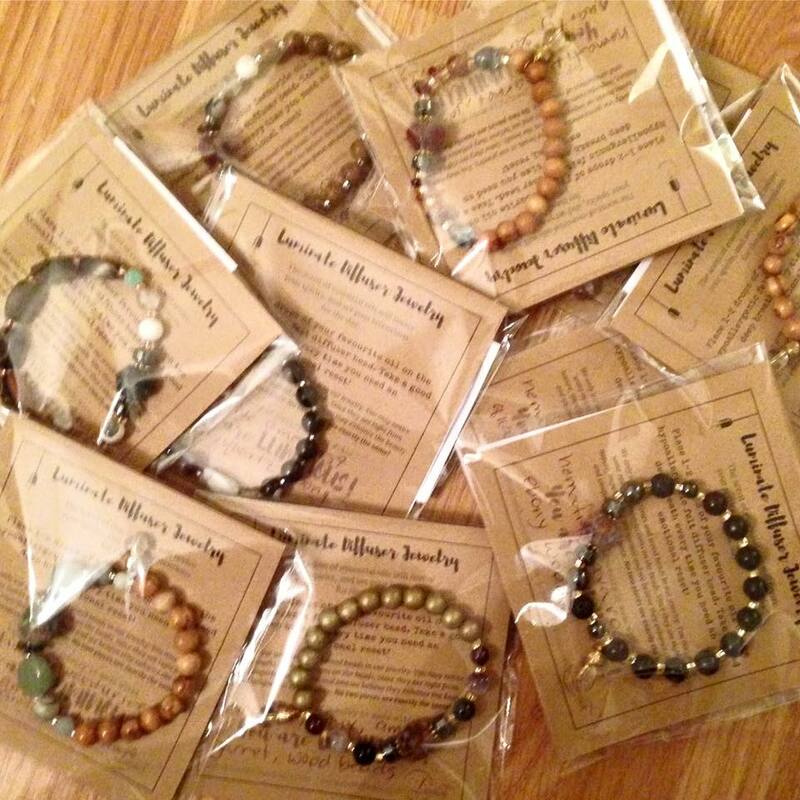 You get one diffuser bracelet (with a felt bead) and two accent bracelets made of wood and gemstones. I can make glitzy stacks or simple stacks. I will design something that works for you! These bracelets are amazing! They each have a handmade felt bead on them, and you put 2-3 drops of your favourite essential oil on the bead. It is the perfect way to bring your favourite scents with you everywhere you go. If you need a lift to your spirits, just take a deep inhale and let the oils do their magic! The aroma last 3 or so days depending on the oil. Each bracelet comes with a 5ml of doTERRA wild orange therapeutic grade essential oil, or some essential oil samples. Items will be mailed 7-16 days from the time of purchase. If you need it sooner, let me know and I can see what I can do. Shipping times will vary. One of my wellness tools/or soul vitamins, is aromatherapy–using powerful aromatic compounds (essential oils) to support my emotional wellbeing. I started making this jewelry for myself. Then I gave pieces away, and I keep hearing back from people about how well they are working to support their wellness. So I decided to go a little bigger! Here's a big question for you....How do you want to feel? In our Soulful Living/Desire Map workshops, we support you to give these feelings names, and create intentions around how you want to feel. Our olfactory system (sense of smell) is tied directly to the limbic system of our brains. The limbic system plays a very important role in supporting our emotions and creating memories. So this makes essential oils a very powerful, accessible tool for our supporting our wellness. Check out this Dr. Mercola article about the science of aromatherapy. We can help you create a piece that supports you in anchoring how you choose to feel. Malas have a long history in eastern culture. Many people use them as sacred tools in prayer and meditation–choosing a prayer or mantra and saying it over and over as you touch each of the 108 beads. As a culture in North America, we are losing our sense of the sacred–the non-negotiable things, or practices that fill our souls. 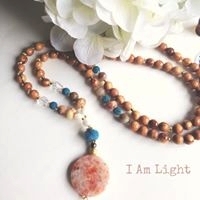 The beauty of this mala is that you decide what it means to you. It's our hope that it becomes a sacred tool for your wellness, however you choose to use it. 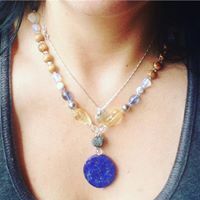 Jenn, founder of Luminate Wellness, will work with you to create your mala using meaningful stones and crystals that support you to remember how you want to feel. If you have worked through a Luminate Wellness workshop (especially Desire Map or WRAP), we will find stones and use colours that will support you in anchoring your core desired feelings, and/or building a sense of hope within. 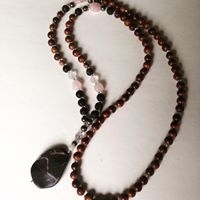 Each mala is strung with a hypoallergenic wool diffuser bead. Put 1-2 drops of your favourite oil on the bead that also support you to feel the way you want to feel that day. It's a reminder to stop, breathe, be present and mindful wherever we are in our day. Use citrus oils and blends (wild orange, grapefruit, citrus bliss and others) when we need to be cheered up. Earthy oils such as vetiver, frankincense and sandalwood are great to support us to feel grounded. Calming oils, such as lavender, bergamot, clary sage, and Serenity & Balance blends, are fantastic when we are craving tranquility and relaxation. Malas vary in price from ($90-$160 depending on the stones and beads used). Click here to listen to Jenn's webinar about essential oils and our emotions. Above is a selection of some pieces we have made. All pieces come with some essential oil samples. Click here to fill out a form, so we can find some oil samples perfect for your personal needs. Since all of our beads are natural, imperfections are normal and we believe they enhance the beauty and uniqueness of each piece. No two pieces are exactly the same! Here are some common stones and beads we use for our jewelry (our stock may not be limited to what is on this list, and may or may not be in stock when you order your jewelry). The crystal beads are breakable. Take care to not drop them on hard surfaces. Olive wood beads made from already cut olive trees in Israel. This beads are made by an organization that creates holy products such as rosary beads. Essential oils can break down non-metal and glass compounds. There is a long metal bead through the diffuser bead. To protect the elastic cording, please avoid getting essential oil on anything besides the felt bead. Use 1-2 drops of oil on the felt bead. It is also effective to put oil on your finger and rub it on the felt bead. If the felt bead needs a refresh, it’s ok to clean it with water­–soap even. Take care to dry off any other surrounding beads. Take off your bracelet when washing your hands, as water can affect the finish of some of the wood beads. If the wood beads start to look worn, you can rub some olive or coconut oil on each bead to spruce them up. Some crystal beads are fragile. Take care to not bang them on hard surfaces. Your mala is strung on wire. This is to ensure that the essential oils don’t breakdown the string. Wire can kink, so it’s best to hang your mala up when you are not wearing it. Avoid bending it if you can. See above for the rest of the care recommendations. Learn about essential oils, aromatherapy jewelry, as well as little dose of inspiration!